In The Big Year, Bostick aces Stu and Brad out of a Pink-footed Goose sighting at High Island in April, and the two miss it throughout the year before finally finding it together on a (very implausible) mountain top in Colorado for their last new bird of their North American big year. Brad and Stu celebrating their Pink-footed Goose sighting in The Big Year. 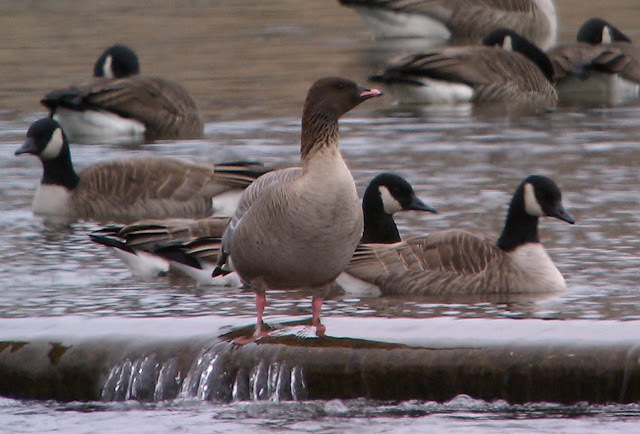 In real life, Pink-footed Geese from Iceland and Eastern Greenland have been showing up each winter for the last few years at scattered spots from Newfoundland to Maryland. Just like Brad and Stu, it took me several chases before I finally saw one in November 2011 in Pennsylvania. Then this winter five have shown up in New Jersey--with three making irregular solo appearances in my county. We know these are separate birds because each one has a distinctive black and pink bill pattern (see photos and IDs of the five here). 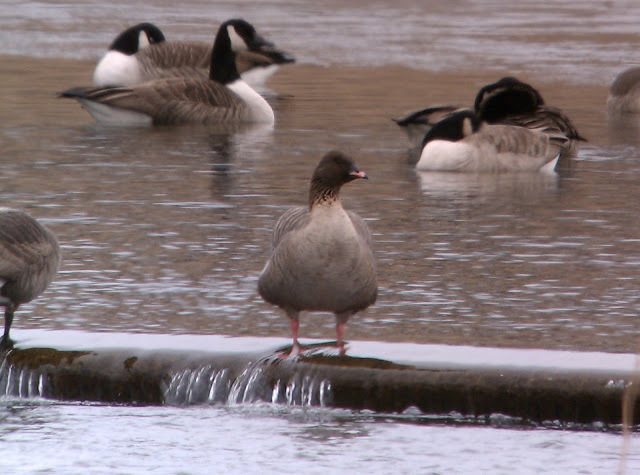 Here's the latest one from Clinton, NJ--photos taken last Friday as it was hanging out with a big Canada Goose flock below a dam in the Raritan River. 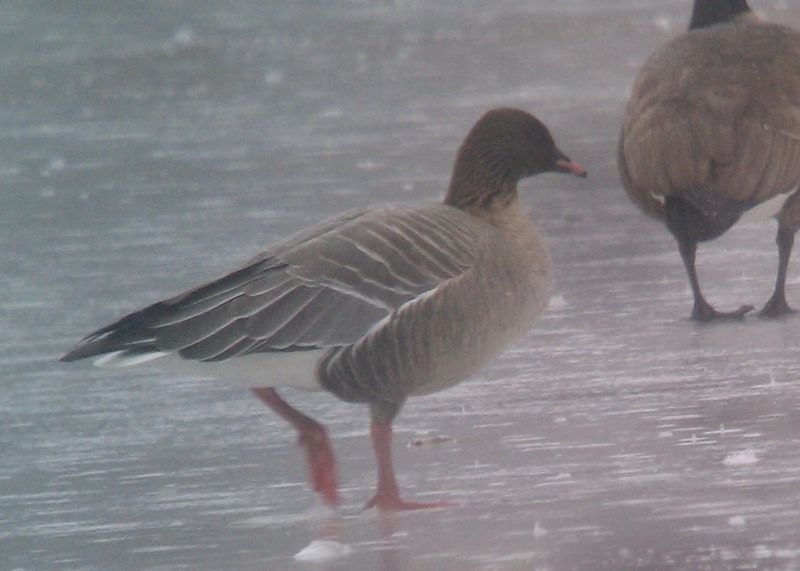 Pink-footed Goose, Clinton, NJ 22 Feb 2013, digiscoped with HTC Incredible phone and Kowa 883 scope. This was a fun bird--it first showed up a few weeks ago, then disappeared. 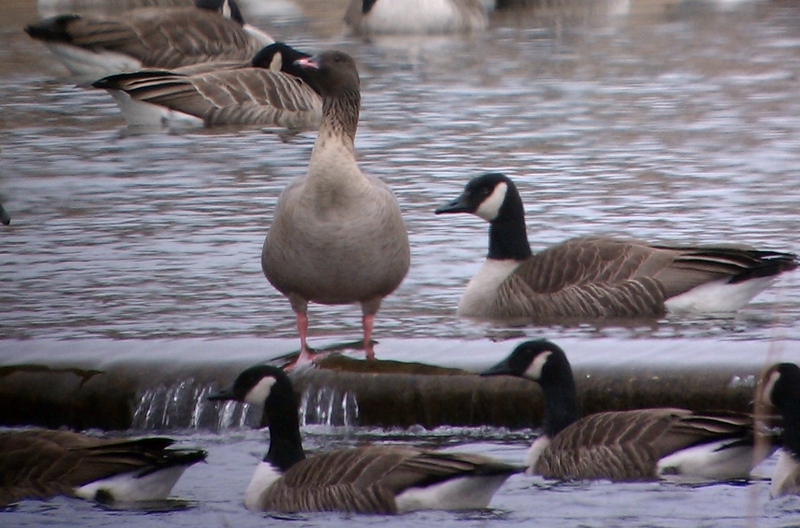 There are tens of thousands of geese in the area, roosting at several lakes and reservoirs, and heading out into fields to forage during the day. Apparently individual Pink-footed Geese roam around a lot, and the ones around here don't seem to use the same roost site every night. When I first saw this bird, it was on a foggy and drizzly day and I wasn't able to get very good shots, so I was happy to have it show up on a nicer day for a more proper photo shoot! PFGO in the rain, Clinton, NJ 11 Feb 2013, digiscoped with HTC Incredible phone and Kowa 883 scope. 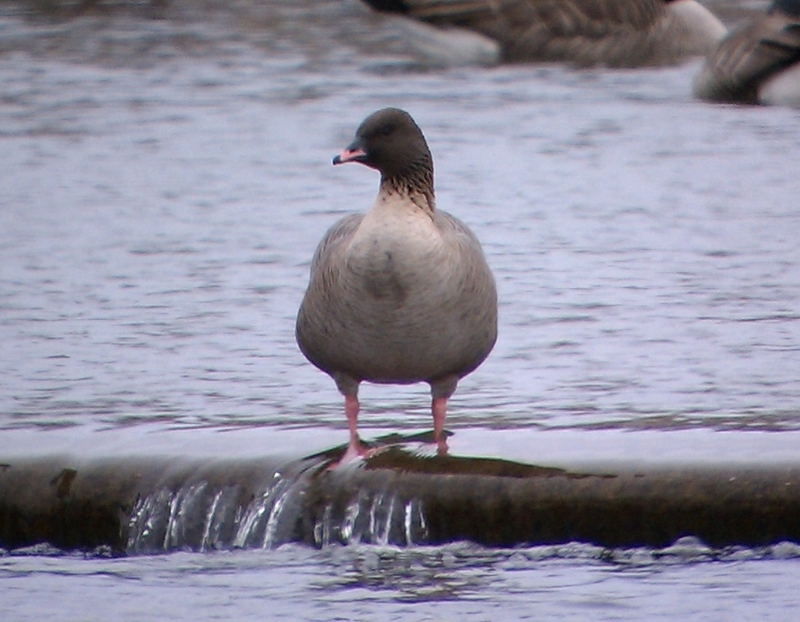 If you want to see a Pink-footed Goose in North America, pay attention to eBird or the ABA Birding News listserv digests for word of a Pink-footed Goose sighting. If you are close enough to go the same or next day, that is often your best bet as these birds may move around a lot. Otherwise, wait for one that appears to be pretty site stable and go for that one--for instance right now there is one in Tom's River, NJ that appears to be sticking to a more regular schedule of a couple of known locations each day. Or you can look for one yourself! If you live in an area with large flocks of wintering Canada Goose, look through every flock you find and maybe someday you will get lucky. In the meantime, you may find other local rarities such as Barnacle Goose, Cackling Goose, or Greater White-fronted Goose (to name a few of the other rare geese we've seen in NJ goose flocks this year). 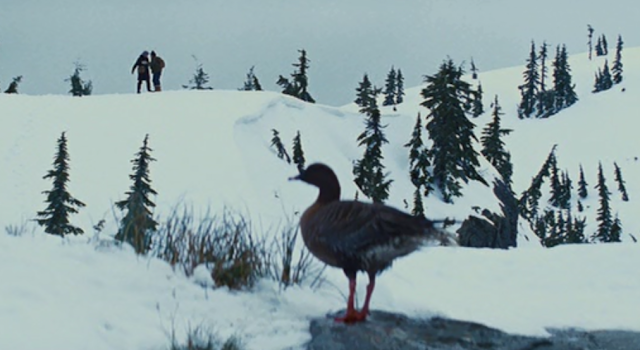 While you are at it, you may learn a greater appreciation for variation in Canada Goose plumage and sizes, as well as plumage abnormalities and the occasional banded bird that may let you track the movements of individual geese across your area. Either way, if you have them in your area, make goose chasing and watching a fun and rewarding part of your winter birding scene! Searching for the Pink-footed Goose has spiced up the the winter birding this year. It's been fun. I caught the first one showing up in Hunterdon and the one recently in Bergen. Great to have an idea of how many are actually here! Great post! Always exciting chasing a bird:) Especially a rare one! How very exciting for you to see these rare birds in your area. Just two days ago, I was fortunate to observe a Ross's Goose that has been hanging around with a Snow Goose along the lakefront. Birding is indeed fun!